The goal of this chapter is to examine the phenomenon of celebrity death and mourning as performed in the context of social media. It focuses on how commercial actors such as global brands make use of famous persons’ deaths in what becomes commodification of death through the process of digital mourning labor. 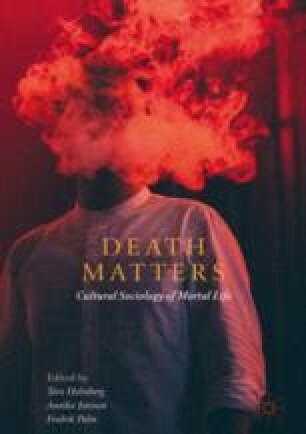 This chapter discusses how often mutually exclusive logics of death and mourning are mixed together with the logics of commerce and profit. It suggests that digital labor is immaterial but materializes in the form of profit generated by the online networking sites and platforms. Consequently, value is not only extracted from users’ digital labor but also from the symbolic meaning and value of celebrity death upon which global brands capitalize. Davidson, J. (2013, August 2) ‘Digital Necromancy: Advertising with Reanimated Celebrities’, Time, http://business.time.com/2013/08/02/digital-necromancy-advertising-with-reanimated-celebrities/, accessed 30 May 2017. Fleeman, M. (2007, May 24) ‘Dr. Martens Shoes Apologizes for Kurt Cobain Ad’, People, http://people.com/celebrity/dr-martens-shoes-apologizes-for-kurt-cobain-ad/, accessed 29 May 2017. Kay, K. (2017, May 28) ‘Millennial “Influencers” Who Are the New Stars of Web Advertising’, The Guardian, https://www.theguardian.com/fashion/2017/may/27/millenial-influencers-new-stars-web-advertising-marketing-luxury-brands, accessed 29 May 2017. Kerns, C. (2016, December 19) ‘On Brands, Death and Social Media’, Marketing Land, http://marketingland.com/brands-death-social-media-200622, accessed 25 April 2017. Lazzarato, M. (2001) ‘Immaterial Labor’, trans. Coilli, P., Emory, E., http://frontdeskapparatus.com/wp/wp-content/uploads/2012/10/Immaterial-Labor-Maurizio-Lazzarato.pdf, accessed December 2017. Mallow, S. (2015) Losing Robin Williams: An Analysis of User-Generated Twitter Content Following the Sudden Death of a Celebrity, University of Northern Iowa, Honors Program Theses, Paper 191, http://scholarworks.uni.edu/cgi/viewcontent.cgi?artic-le=1182&con-text=hpt, accessed 4 December 2017. Penfold-Mounce, R. (2015) ‘Not Just for Halloween: Dead Celebrities Comes Back to Haunt Us All Year Round’, The Conversation, http://theconversation.com/not-just-for-halloween-dead-celebrities-come-back-to-haunt-us-all-year-round-41733, accessed 29 April 2017. Rosa, H. (2015) ‘Social Acceleration and the Need for Speed. An Interview with Hartmut Rosa’, https://www.versobooks.com/blogs/2158-social-acceleration-and-the-need-for-speed, accessed December 2017. Van den Bulck, H. and Larsson, A. O. (2017) ‘There’s a Starman Waiting in the Sky’ Mourning David #Bowie on Twitter’, Convergence: The International Journal of Research into New Technologies, online first: https://doi.org/10.1177/1354856517709670.